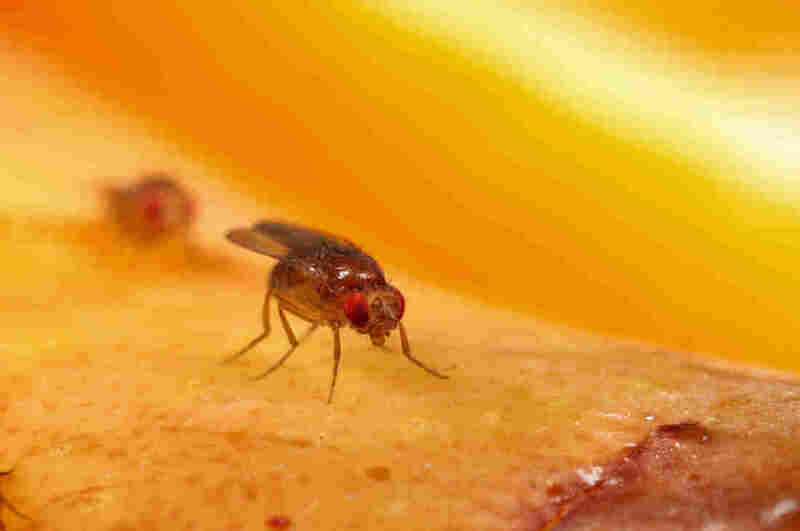 Ancient Cave Dwellers Swatted Fruit Flies, Too : Shots - Health News Drosophila melanogaster is a mainstay of genetics labs, but its wild origins have been mysterious. Scientists have now traced the pesky fly to a particular fruit — a human favorite 10,000 years ago. Drosophila melanogaster, the common fruit fly, is a mainstay of genetics and biology labs. The humble fruit fly now lives with humans all over the planet and is one of the world's most studied creatures. For more than a century, biology and medical laboratories have depended on this fly — one scientist notes that at least nine times, the Nobel Prize in Physiology or Medicine has been awarded for research on Drosophila. One of those prizes was won by Thomas Hunt Morgan of Columbia University, whose fly research in the early 1900s plucked this species from obscurity and transformed it into a mainstay of genetics. "It's small; it's cheap to raise; it has interesting genetics," explains Thomas Kaufman, a biologist at Indiana University in Bloomington. "We think that flies are quite charismatic. They're wonderful. They're beautiful little animals, and we love them. Seriously." "I've been wondering about this for the past 20 years," says Marcus Stensmyr, a biologist at Lund University in Sweden who uses these flies to study the olfactory system. "It's really been kind of a life-long ambition, if you wish, to find where they come from." "You find them in your kitchen. You find them in my kitchen — you find them in everyone's kitchen," says Stensmyr. "But if you go out into the forest, you simply don't find them." "After a number of failed excursions down to Africa," says Stensmyr, "we thought, 'OK, so maybe they are associated with some specific fruit in their original home.' 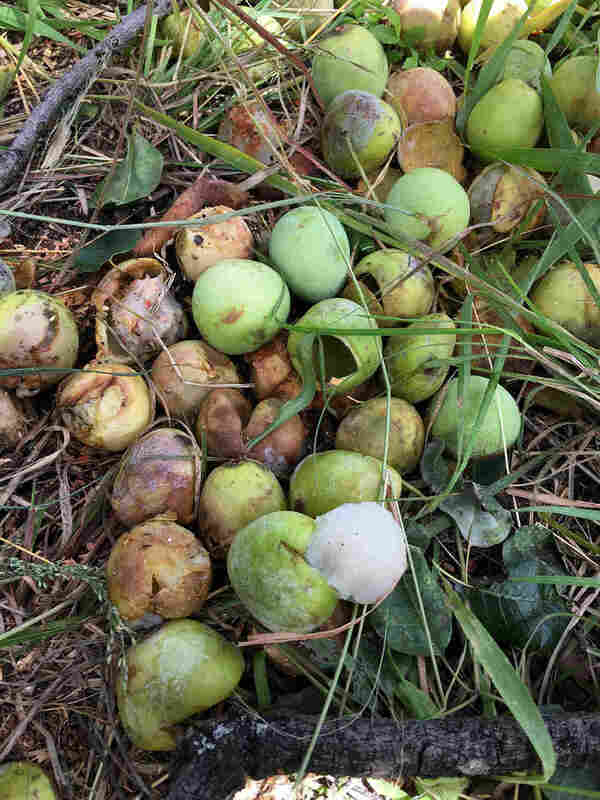 "
The marula fruit seems to hold a special power over D. melanogaster, which prefers it above all others. "We came to a candidate fruit — that was marula fruit," says Stensmyr. The yellow fruit is about the size of a large plum, with a hard stone in the middle. "It has a sweet and nice taste." "We found tons of flies," Stensmyr recalls. What's more, so does a breed of fly that's commonly used in labs. This strain was established in 1916 from a fly population in Canton, Ohio. "They actually have retained the preference for marula," says Stensmyr. "They would go for the marula as well." "They really, really loved marula," says Stensmyr, who points out that the stones found date from about 12,000 years ago to about 8,000 years ago. "During the times when these caves were inhabited, the San people must have brought enormous quantities of marula into the caves." "I particularly liked going and catching the flies in the painted caves," says Kaufman. "That was inspired. It's really a neat paper." "I thought it was fantastic," agrees Celeste Berg, a developmental geneticist at the University of Washington, Seattle who has used flies in her research for 30 years. "I thought their data was really quite striking." "I think it's exciting to learn the origins of fruit flies and, even if you're not an ecologist or a population geneticist, I think it's just natural to be interested in the history of the organism you study," says Berg. "I had assumed that fruit flies liked all kinds of fruit — especially bananas. I didn't even realize that they preferred citrus. And it's not even really citrus that they prefer; they prefer this particular marula plant, which I also had never heard of." "They built a good story," says Andrew. "It's very hard to prove something that happened 10,000 years ago or more. I like the story." As to whether all the details are right, she says, "I don't know; it does seem plausible, based on the amount of marula fruit stones they found in the cave." Based on this paper, says Andrew, the old saying, "time flies like an arrow, and fruit flies like a banana," should really be changed. "Time flies like an arrow," she says, "and fruit flies like an orange, or a marula fruit, or perhaps an orange spiked with ethyl isovalerate."